Maura Dugan, Hannah Schiffman, Sharon M. Bueno, Andrew Farr (standing l-r) Bernie Krzys, Rob Krzys, Mike Kezdi, Dan Sisko, Jim Rush, Lillian Lopeman and Elizabeth Stull. Nine thousand, one hundred and twenty-five days. That’s how long we have been bringing you the latest trenchless industry news. A shorter way to put it would be: 25 years. Where does the time go? What started out as a bimonthly publication about a fledgling industry with a strange name has developed into the go-to publication about the multi-billion dollar global industry called trenchless technology, an industry that addresses the needs of our underground infrastructure. In 1992, Trenchless Technology came to you via the U.S. Postal Service or you could pick up a copy at a trenchless tradeshow. 2017 is a new generation with new distribution options to reach you. Today, we bring trenchless news to an audience of nearly 200,000 via multiple media outlets: magazine, digital edition, website, Twitter, Linkedin, E-Newsletters. Over the years, it has established the industry’s most prestigious awards with the Trenchless Technology Projects of the Year and Trenchless Technology Person of the Year, as well as growing its Top 50 Trenchless Design Firms Survey into one of the most widely read stories each year. When Trenchless Technology first came to you, who could have foreseen all the technological evolutions that have impacted an already dynamic and cutting-edge industry? What lies ahead? We can’t wait but for now, it has been a glorious ride. 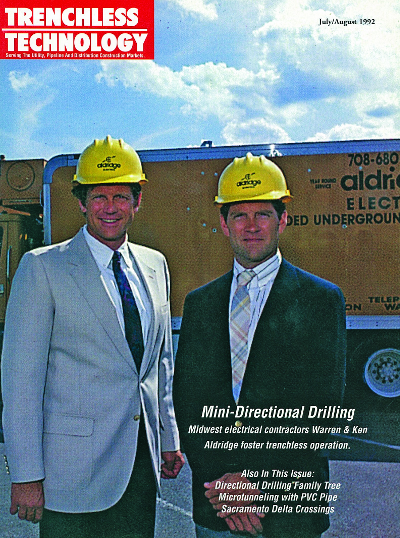 Trenchless Technology magazine was the brainchild of Krzys, who was no novice to trenchless industry at the time, having served as executive vice president and later president of American Augers from 1984-1991. Krzys forged many relationships with the industry’s key players and he knew that trenchless technology was on the rise when he left American Augers. By spring 1992, Krzys, who also had a publishing background, decided a magazine was needed to focus exclusively on the trenchless industry. There were doubters that it could succeed, but Krzys was confident. To gauge interest in a trenchless magazine, Krzys created a mock-up of what the magazine would look like so he could pitch it to those in the trenchless industry. He took it to the 1992 No-Dig Show in Washington, D.C., where interest was immediate — Trenchless Technology was off and running. Trenchless Technology was a hit, and the publication grew from a bi-monthly to a monthly publication in just two years. In addition to the monthly publication, the Trenchless Technology team also produces four supplements covering horizontal directional drilling, pipe relining, microtunneling and its exclusive Directory of the North American Trenchless Technology Industry (in its 24th edition). Trenchless Technology evolved into Benjamin Media Inc., the home of seven different construction publications and a multi-media conference department. Experience is the word that comes to mind when discussing the BMI workforce, Krzys says, noting 18 staffers have more than 10 years with the company and started with Trenchless Technology. Marketing Director Kelly Dadich leads the way with 21 years at BMI. The Trenchless Technology team has four core members who have logged 15-plus years of service (plus countless miles in covering the industry), with editors James Rush and Sharon M. Bueno each in their 19th years and advertising account manager Dan Sisko with 16 years. “With our decades of combined experience immersed in trenchless technology, we have been able to build relationships with industry leaders, allowing us to be in a unique position to report on the trends and issues that are driving the market,” says Rush. Rob Krzys, who has been with Benjamin Media for more than 24 years, now serves as president of the company. In his tenure, he has worked in nearly all facets of the magazine, working in the conferences, audience development and marketing departments, as well as in digital media. His deep understanding of the industry, as well as his father’s, have led him to a lifelong commitment to promoting and growing the industry. Since its 20th anniversary in 2012, Trenchless Technology has increased its coverage of the trenchless market, using the latest technology to reach and engage its readers. The magazine — with a BPA-audited 38,000 subscribers — has integrated full trenchless coverage using social media modes through its website (trenchlesstechnology.com, which has more than 15,000 visitors a month) and weekly E-newsletters, as well as monthly HDD- and pipe relining-specific E-newsletters, which reaches 12,437 subscribers. In recent years, the team has actively utilized Twitter (@TrenchlessTech) and LinkedIn, as well as other forms of social media to spread trenchless news and interact with its readers and its worldwide trenchless audience. “Social media has opened the door to an entirely new world when it comes to promoting our events, the magazine or the industry in general,” Rob Krzys says. One of the cornerstones of Trenchless Technology to this day remains its commitment to educating owners, municipalities, engineers, contractors and manufacturers on the methods and technology. Today, we have a multi-media conferences department that manage seven trenchless-related events each year. The conferences department also produces 10 trenchless-focused Webinars each year. For a publication that some doubted could find enough information to fill a magazine each month, Trenchless Technology has spawned numerous books to make sure its readers were getting all the coverage. The magazine has produced popular annual supplements catered specifically to the HDD, pipe relining and microtunneling markets, as well as launching Trenchless Technology Canada in 2014. This quarterly publication fills a need for Canada, which is a boon of trenchless work over the last 25 years. “The growth and acceptances of trenchless technology around the world has fueled our push to bring the magazine to a larger audience. Canada was a natural extension of our publication,” says Rob Krzys. The reputation of the magazine and its staff is a source of pride for both Bernie and Rob Krzys, each noting that no other industry magazine has the same collective trenchless experience. “Our core people are still here and are involved in the industry, working with various trenchless associations in key roles,” Rob Krzys says. For example, Jim Rush currently serves on the Trenchless Technology Center Industry Advisory Board and Dan Sisko recently served as chairman of Government Relations Committee with NASSCO. The magazine and company have partnered with leading associations and universities over the years on events such as AEM and at the biennial ICUEE show to showcase industry experts for attendees on its Demo Stage, as well as NASTT-BC Chapter and CATT on their Trenchless Road Show program. Trenchless Technology has also partnered with Arizona State University and Dr. Sam Ariaratnam to produce the HDD Academy. Teaming with such respected organizations allows all parties to expand their reach to educate the trenchless community. Benjamin Media has also worked with AEM with its Call of Duty auction at the ICUEE show. The Call of Duty Endowment helps military veterans secure high-quality jobs and raises awareness of the value vets bring to the workplace. The company has participated in Akron Children’s Hospital’s Holiday Tree Festival, as well as partnered with the Office of Veterans Services at the University of Colorado Boulder to offer scholarships to veterans to attend its annual Microtunneling Short Course. In 2016, the company launched what it hopes to be its greatest goodwill endeavor: World Trenchless Day. “There is a day to celebrate the most innocuous items, such as donut or pizza day, etc. Our team thought: Why not a day to bring attention and celebrate our industry? We chose the fourth Thursday in September to be that day: World Trenchless Day,” Rob Krzys says. “The inaugural effort and response by the industry was outstanding. People really embraced the idea. What does the future hold for Trenchless Technology? We have no crystal ball but we have no doubt the next generation of trenchless professionals are ready to take the reins and lead the way for the next 25 years. Sharon M. Bueno is managing editor of Trenchless Technology and has been with Benjamin Media Inc. for nearly 20 years. Sharon and the Trenchless Technology Team recently received a Regional Silver Award at the American Society of Business Publication Editors annual Azbee Awards. Sharon graduated from Youngstown State University — home of the Penguins — and majored in journalism and history. Sharon Bueno is the Managing Editor of Trenchless Technology magazine.